Game of Thrones entered the "Garden of Bones" this week, as Joffrey and Tyrion did battle; Daenerys took a major step for her people; and Melisandre showed off the power of her... lady parts. Below, Round Table panelists Matt Richenthal, Eric Hochberger, Carissa Pavlica and Carla Day breakdown the latest trip to Westeros. Won't you join them? Matt: As I outlined in my review, I loved pretty much every scene. But I'll cheat here, and tease my next answer, by combining the back and forth between nephew and uncle. Tyrion's interruption of Joffrey's Sansa torture was put T-Bone, funny, direct and effective. But J-Money's revenge against the action? As disturbing as any few minutes on TV I can recall. Brutal, fascinating stuff all around. Eric: Daenerys' showdown at the gates. Emilia Clarke was just amazing in that scene as Dany stood up to the thirteen. It was also not unhilarious hearing Xaro Xhoan Daxos' name pronounced. Carissa: Robb in the beginning on the battle field. Even in reading the books there wasn't a lot of detail about him acting as such, just second hand news. I felt this scene gave us a lot of insight into who he is as a man and a leader. Even as young as he is, he is fair and compassionate, yet brutal as necessary. Good stuff. 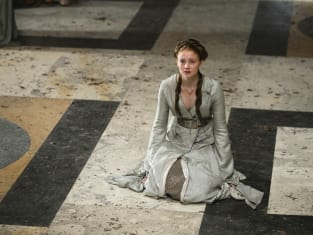 Carla: In an episode full of torture, one of the most touching moments was after Tyrion saved Sansa from Joffrey's wrath. She showed that she is no longer the spoiled, teenage girl, but a strong Stark when she told Tyrion, “I am loyal to King Joffrey, my one true love.” And I loved his heartfelt response: “Lady Stark, you may survive us yet." Who won this round, Joffrey or Tyrion? Matt: Tyrion, because he embarrassed the King in public, but I fear for future rounds. Joffrey proved here that he is more than a spoiled, powerful brat. The kid knows how to connive. Eric: Joffrey: 1. Tyrion and that whore's bum? 0. Carissa: Tyrion. As he will win every round. Joffrey is an embarrassment. I can't imagine being his mother. I'd kill him myself. Carla: Tyrion. He showed that he is the one with real power. Joffrey and Cersei better watch out, Tyrion has succeeded in usurping their power without them realizing how much. Melisandre's crotch smoke: Cool and exciting or... WTF? Matt: WTF all the way. Of course I recognize the fantasy elements involved in a show such as Game of Thrones, but I hope this act isn't a harbinger for how most battles or dilemmas will be solved. I adore the series for its characters and their machinations, not for whichever side can cast the most damaging spell. Eric: That was the sexiest and scariest smoke monster I've seen since Lost. Probably helps that I had my WTF moment when I read it. Carissa: She is too wicked for me. WTF it is. She must be as proud a mother as Cersi. Good smoke man, run along now! Carla: WTF! That was not cool or exciting. I don't like her and that black smoke clawed thing was nasty! Would you prefer to work for Tywin Lanister or have your insides gnawed out by a rat? Matt: It's close. Like, really close. But I like my gallbladder more than my pride, so I'll go with Lannister. Carissa: I hated those scenes. How dare they do that to a rat! Rats are the only rodent who will, by nature, not bite a human. Thus, burning them alive to force them to try to chew their way out of the softer tissue of belly rather than bucket. Gimme Tywin. He doesn't seem so bad. Eric: Is this a trick question? I'd gladly scoop up Tywin's golden poos before you light that rat bucket on fire. And don't kill me, Carissa, because I'm not condoning it, but, man, that was pretty ingenious form of torture. Carla: Work for Tywin, because at least I'd still be alive and could plot my escape. Will Daenerys regret taking her people into Qarth? Matt: No way! I'm sure the Garden of Bones is just a nickname, right? No way they actually dispose of folks outside their walls, right? It's probably like Little John from Robin Hood, one of those ironic monikers that actually means the opposite and everyone is Qarth is warm and welcoming. Eric: You kidding me? Did you see inside those doors? I'm ready to book my (dragon) flight. Carissa: I think Dany will regret pretty much anything she does, poor girl, until her dragons are huge. Assuming they make it that far. She really has nothing else in her bag of tricks but the dragons. No money, no army, nothing. Talk about swimming against the tide. Carla: Doubtful. It is a lush and beautiful place. Even if it is bad city, it can't be worse than dying in the Red Waste or outside in the "Garden of Bones," right?